Copyright © 2011-2014 Deborah M. Zajac. ALL RIGHTS RESERVED. Monday was a Terrible, Horrible,No Good, Very Bad day, and I wanted He-Man and myself to be someplace sunny and warm with a nice drink and great view and, not the Emergency Room we were in. I was concerned about my kitchen pipes they were running really slow and didn’t smell so good no matter how much I put stuff down the drain to deodorize them, so I cleaned out the closet to get to the trap-door, so He-Man could get under the house to inspect the pipes. He cleared up his schedule to have time to get under there and while poking around discovered several sections of the kitchen pipes, and our shower pipes were rotting out. (Our house is over 50 yrs old now.) He touched the shower drain pipe and it crumbled and started leaking. I was above him over the shower and heard his reaction ^^%$#! He came up and called a Plumber. The soonest we could anyone over would be Weds. Ok, we can deal with that we have 2 full bathrooms. He-Man was going to take a shower in the hall bath and soon discovered that was plugged up. The water wasn’t draining at all. He snaked it out, and still the water wouldn’t drain. <sigh> No showers, and no plumber til Weds! Sponge baths will have to do. Fast forward to just past 10PM He-Man thought, ” Ah, I can do a quick work-out and get a shower at the gym!” On his way to the gym He-Man’s toe caught on something in the grass; and he fell. I heard him leave, then the car alarm was beeping blaring and I couldn’t figure out why He-Man wasn’t shutting it off. Shaking my head I went to the front door to find out what was happening and found him laying in the grass! He said he thought he broke his knee. He wasn’t able to stand up. He rolled to a sitting position and I saw straight-away his knee wasn’t right. I knew I had to take him to ER. Using my rolling office chair we got him in my car, and off we went to the Emergency Room. Hours, X-Rays, and an Ultra-sound later the Doctors told us the grim news. He’d ruptured his Patella Tendon. The Doctor fixed him up with a knee immobilizer and set him up with an appointment to see the Specialist the next morning. The Specialist ordered surgery, and scheduled for it Wednesday morning. Oh, but the Plumber is coming on Weds! We had to reschedule that to Friday. We hardly slept at all since Monday, but got a few hours sleep and got up and ready to get to the hospital for surgery Weds. morning. When we arrived they pushed out the surgery until 1PM because the surgeon had an emergency surgery come up. So we went back home and tried to nap. We got back to the hospital and the surgery was on time. It went very well, and it was out-patient so He-Man got to come home. He’s been resting comfortably and has good pain meds. We’re even catching up on sleep now, and the Plumber was out yesterday and fixed the pipes so we have both bathroom showers and my kitchen sinks draining better than they have in months. He-Man has a L O N G road of recovery and physical therapy ahead of him but I believe “Set backs are the stepping stones to come backs!” We will forge on! Since I haven’t taken any images of anything but He-Man’s knee this week I thought I’d dig through my archives for something to work on for my weekly Project 52 image. 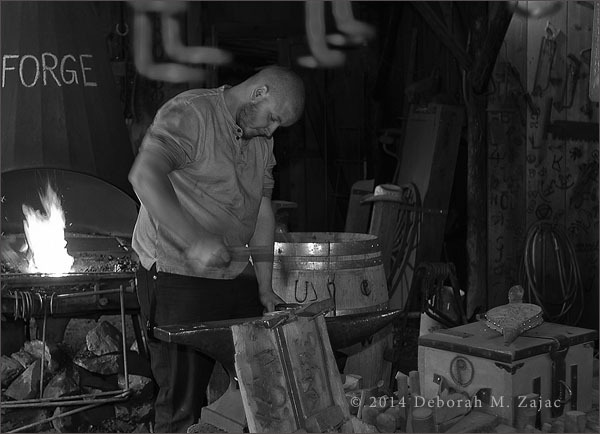 This one of the Blacksmith in front of the Forge seemed to fit nicely with my feelings this week. Sorry to hear about all your mishaps, here’s hoping this week is much better. what a tale!! Poor guy!! Wishing a speedy recovery for his knee and your plumbing!! Thank you so much Cybele Moon! Oh, yeah, that is a good fit. You had a spectacularly bad time! I’m so sorry to hear about all that. We had our pipes crumble a few years ago~ NOT FUN! I can’t even imagine how that knee must feel. Sorry to hear about your very difficult week. But now the plumbing is fixed and the knee has been repaired. You have much to be thankful for and I know that you will continue to lean into the light. Wow. Hard to like this without saying that I’m glad the surgery went well. Ditto for the plumbing I wish him a speedy recovery and a good therapist. Thank you Dan for the well wishes I’ll pass them onto him. Our sentiments are like yours. We’re hoping for a good therapist too. I had a really good one when I broke my foot. Maybe he’ll get her.